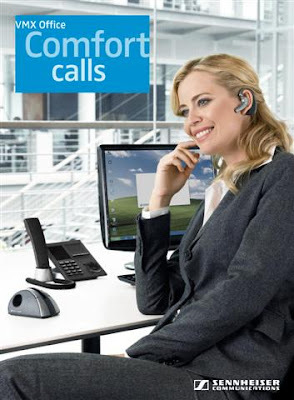 Jabra PRO 9460: With Jabra PRO™ 9460 and Jabra PRO™ 9460 Duo headsets, office staff can answer calls made to either of their desk phone or softphone, even while away from their desks. Desk and softphone are united by a stylish touch screen base that offers complete freedom with a wireless range of up to 150m. Using the touch screen base you can easily hold or merge calls for conferences from both phones. Several state-of-the-art sound technologies enable the Jabra PRO™ 9460 to deliver unrivalled call clarity and safety. Wideband quality ensures that the sound you hear is crystal clear, while SafeTone technology protects your hearing. 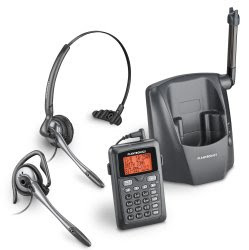 Headset controls: Includes remote answering/ending of calls, call rejection, redial function, swapping between held calls, volume controls and microphone mute from both desk and soft phone. Voice recording from desk phone - Save your conversations on PC (PC recording applications required). Security: encryption between headset and connected device. Security: Kensington Lock: Theft protection of the base. Revolabs may be one of those companies you've never heard of, but if you've used the audio system in your companies boardroom, your local church, a trade show or similar event, you may very well have used their equipment without even realising it. The Revolabs FLX is a new product, that opens their products up to a larger audience which includes SMB all the way through to enterprise size businesses. Revolabs had heard that Epilio do a lot of work enabling Sametime with telephony systems, so sent us the Revolabs FLX2 to review. Video review located at bottom of article. 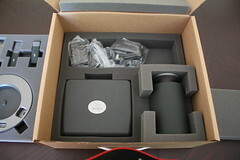 The device comes in a environmentally friendly recycled cardboard box, and upon opening it, you are immediately presented with the instructions sheet for connecting the device. 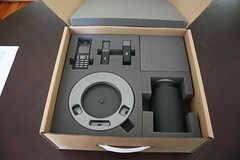 After removing the instruction sheet, you're can see the core components for the package, the wireless handset, the wireless speaker, the charger station and the wireless microphones. The bottom layer contains the base station which connects to the phone, bluetooth and audio sources and two power supplies and a phone cable. The next step is to connect everything up. 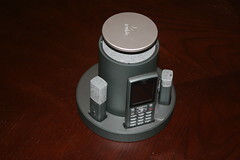 The wireless microphones, handset and speaker sit in the charger station, which is connected to the power and the base station is connected to a power supply and your PC/audio system, bluetooth device and telephone system (see video for connections). The unique thing about the Revolabs FLX setup, is that the speaker and microphones are all wireless. What this means is that you can give a microphone to someone at one end of the table, and a microphone to someone at the other, and put the wireless speaker in the middle or anywhere else you want. This avoids the situation I often hear or see, which is a speakerphone that has been placed right beside the projector with the cooling fan blowing on it during the entire conference call, leading to a pretty miserable experience for the person attending the call on the phone. In the review system I was provided with, I had a table top microphone and lavalier/lapel microphone. 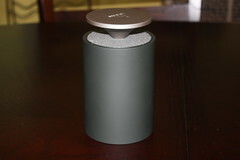 The base station that does all the work, can be placed on a shelf somewhere or in a cupboard, it can connect to your telephone line, a Bluetooth device and a device that has audio input and output. In my case, I connected the device with my regular telephone land line, my Bluetooth phone (iphone) and connected it to my PC for use with IBM Sametime, Microsoft Lync and Skype. 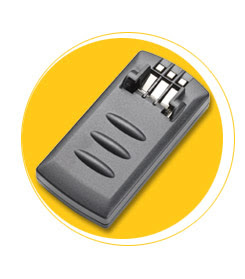 Connecting it to your phone line is a just a case of plugging in the supplied phone cable, and connecting it to your phone jack. When it's connected, the handset immediately shows the phone line as being there, and you can now make and receive calls using the handset. Audio quality as you'd expect from a high end audio company was very good. 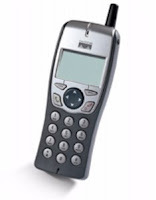 The handset has an easy to read screen, provides a list of missed or recently made calls, has a directory for storing phone numbers and options to configure various settings. Sometimes for my big fat fingers the buttons felt a little small, but they always worked, and I got what I expected when I pressed them, so there wasn't really a problem. Bluetooth pairing was simple using the handsets menu system. Unfortunately, you can only receive calls, or join existing calls using bluetooth, you cannot use the handset as a dialer for your Bluetooth device, so if you want to join the call using your Bluetooth phone, you have to dial the call using the phones keypad, not the Revolabs FLX handset. In most cases this won't be a big issue, in the future as more companies move towards replacing desk phones with mobile phones, this might be a missed feature. That time is a long way off though, and I'm sure Revolabs could address that if it became a big demand. Connecting to my PC proved a little difficult, and it turned out to be an issue with my laptops audio system. If I connect a mono 3.5mm cable to my microphone socket on my laptop it turns out, my laptop won't record audio from it, the cable has to be a stereo cable. The sockets on the Revolabs base station are mono, so I was going mono to mono. Using a mono to stereo converter cable solved my issue. My desktop PC didn't experience this issue, and it turns out it really depends on the chipset in the machine, or driver, as there were even differences between similar PCs, but made at a different time. Once I had connected the device to my PC, I tried it on IBM Sametime, IBM Sametime with SUT, Microsoft Lync and Skype audio calls. The quality, as with Bluetooth and the phone line was excellent, with the PC audio it is even clearer than the phone line due to the much higher quality codecs used over the ancient phone system. The device doesn't have any specific plugins for Sametime or Lync, like some of the Plantronics devices for example so is purely interfacing with the PC as a MIC and Speaker, so this means if you mute the device on the PC that isn't reflected in the handset and vice verse. There is currently a USB socket on the base station and charger station, but this does not interface with the PC, in the future it would be great if that could be used as the audio connection, and also to provide a method for updating the handsets address book from the PC. One thing that is really nice about the Revolabs FLX2, is the ability to merge audio streams, what does this mean? Imagine you're on a Sametime phone call, using the PC audio connected to the Revolabs device, and the telephone rings, well now you can answer the phone and the Sametime calls audio and Phone calls audio are now merged, so you can continue to hear and speak to the Sametime person, and telephone connected person, but more importantly, the Sametime folks and telephone folks can also hear and chat to each other. The mixing levels between the line scan be controlled by a menu on the wireless handset. One thing the Revolabs has going for it, is certainly it's looks. Everyone that has come by and seen it sitting on the table have always asked "Sweet, where's mine?" If you're a company that has spent a small fortune on your conference room table, this thing is not going to look out of place if it's made from glass and metal or is 200 year old antique mahogany. It's a really nice, classy looking device. Overall I was very impressed with the device. It's has an attractive unique design, offers great audio quality which is really what matters and a number of connection options. You hit the office talking. An important client called you on your mobile as you parked the car. Taking the call while you parked was the most natural thing in the world. You nod and smile your hellos to your colleagues, and finally press the discrete button on your headset to hang up, pleased with the outcome of the call. You’re placing your briefcase beside your desk when another call comes in. This time it’s on the office phone. You touch the same button on your headset, take the call and boot up your PC. headset on, you can make some notes on your computer without the sound of the keys disturbing your call. In the space of five minutes, you’ve used your mobile phone, your office phone and your PC to take calls. All on your VMX Office headset. But it’s not something you stop to think about: it has become a natural part of your working routine, replacing the three separate headsets you used before. Last month Logitech announced a collaboration with GN Netcom to offer select Jabra headsets and speakerphones to SMBs and enterprises alike as part of Logitech’s Unified Communications solutions. Today, I’m happy to report that our first offerings to come from this collaboration – the “Logitech powered by Jabra” BH870 Bluetooth Headset and BSP420 USB Speakerphone – are officially available in the U.S.
With these “Logitech powered by Jabra” products – both of which are certified for Microsoft Lync, Avaya and Cisco – Logitech now offers businesses a full range of UC solutions ranging from the meeting room with LifeSize video conferencing end points and infrastructure products to PCs, Macs and tablets with Logitech webcams, headsets and speakerphones. The Logitech® BH870 Bluetooth Headset was designed with function in mind, providing clear, hands-free communication capabilities, whether you’re at the office or on the go. It includes Class 1 Bluetooth connectivity, ensuring you can connect to your phone from up to 300 feet away – perfect for when you need to make a call away from your desk. And, because one style doesn’t fit all, you can sport the BH870 “ear hook” style or headband style. 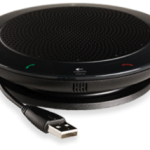 The Logitech® BSP420 USB Speakerphone is available in a Lync-certified version and a standard version. Both deliver crisp and clear audio calls, bolstered by a full-duplex speakerphone with built in echo cancellation technology. The Logitech BSP420 is USB-powered, giving you a simple setup process and easy transportability. It also includes illuminated touch controls that are intuitive and easy to use. 1) Blackwire C210 - The Blackwire C210 computer headset is very efficient; it has inline controls with call answer/end, mute, and volume up and down. This is great for webinars and conferencing and has more natural voice because of the superior DSP. Sound guard protects against audio sound spikes. This headset has wide band for best PC telephony. On the side of the charging base tower you'll see a round dial with numbers on it. Line up the dial so that the number 1 is directly lined up with the raised horizontal plastic ridge to the right of the dial. This is the correct configuration setting for almost all phones in the US. Trust me. Don't wonder about it. Just set it to 1. Now, turn the charging base tower upside down and you'll see a slide switch with ABCD. Set that to B. This is the outbound master volume (how loud you sound to the caller). Next, on the back of the baser tower you'll see another slide switch with 1234. Set that to 2. That is the incoming master volume (how loud the caller sounds to you). You're all set! If you hear echo when you speak, then use the down arrow button on the back side of the base tower. Press "down" arrow button several times until the echo goes away. 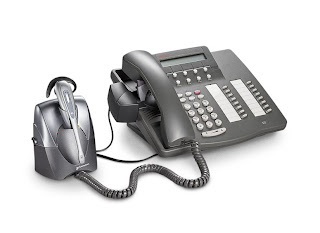 The Cisco IP phones (series 7940, 7941, 7960, 7961) have a dedicated headset port on the back and a headset button right on the front of the phone. If you buy a wireless headset like the CS55 or CS70 WITHOUT also buying the optional HL10 handset lifter, then you will plug the CS55 base into your Cisco phone's dedicated headset port and you must change the configuration setting on the CS55 base tower to number 4. This is the round dial with the slit down the middle which is located on the left side of the CS55 base tower. Turn the dial until the number 4 is directly lined up with the raised plastic ridge to the right of it. When a call comes in, turn on your headset by pressing the button on your earpiece and also press the "Headset" button on your Cisco phone to answer the call. Press the same buttons to end the call. You obviously won't be able to answer or end a call while away from your desk since the Headset button on your Cisco desk phone is acting as your hookswitch. On the other hand, if you have a wireless headset AND you also have purchased the optional HL10 automatic handset lifter, then you will ignore your phone's headset port and headset button completely. You'll plug your wireless headset into your Cisco phone's handset receiver port and your handset receiver into the other port on the bottom of the wireless headset base tower marked with a symbol of a handset receiver. In this set up you will want the configuration dial on the left side of the base tower to be turned to number 1 so that the 1 is directly lined up with the raised plastic ridge to the right of the dial. When a call comes in you have one-touch call answer/end capability by just pressing the button on your earpiece. No need to press any button on your Cisco phone, so you can answer/end from anywhere in your 300 ft. range. 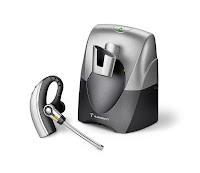 Here's the link to Founders Telecom for all the Plantronics CS55 and a link to the Plantronics HL10 handset lifter if you need it. It's almost impossible to find replacement earbuds for Plantronics bluetooth headsets -- but we found them! Unfortunately, the retail stores don't want to devote any shelf space to inexpensive items that have no profit margin so it's nearly impossible to find replacement parts for you bluetooth in a local store. You will be able to find them online but you'll have to buy a bunch because they usually have a minimum. There's just not a lot of businesses who can operate and stay in business shipping earbuds all day, so hopefully you need a charger, some ear hooks or something else besides earbuds. 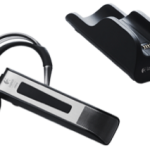 Here's the link with a good assortment of all the Plantronics bluetooth accessories and replacement parts. If you have corded Plantronics headsets that have the QuickDisconnect on the end of the cord (the black plastic pull apart rectangular piece that unsnaps in the middle between the straight cord and the curly cord), then all you need is the Plantronics Y Training cord. It is a cord in the shape of the letter Y with QuickDisconnect on all three ends. It allows you to snap two headsets onto one cord. Here's the link to the Y-cord. If you have wireless headsets (or any corded headset that has a square modular plug on the end instead of the QuickDisconnect mentioned above), then you would instead need the headset training adapter. It gives you two modular jack openings to plug two headsets into one phone. Here's the link to the training adapter. 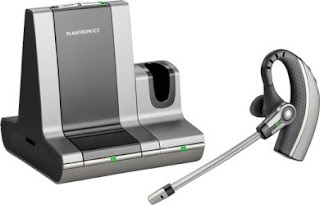 If you are a telecomuter or have a home-based business then the Plantronics CalistoPro will make your day. It is a wireless bluetooth headset and a cordless 1.9 GHz frequency phone all in one. You can even pair the same headset with your bluetooth cell phone, so it is a multi-purposed device. If you use Outlook for organizing your contacts you can download up to 100 contacts directly from a USB cable into the CalistoPro phone. You can wander with the phone at your home or office up to 300 ft. which is the length of a football field. It really does work! Of course if you don't have the little phone clipped to your belt or with you in some form or fashion, then you can only go about 30 ft. with your headset since bluetooth technology is short range. If you want the full football field range you have to bring the mini-phone with you, which isn't a problem because it's only the size of a deck of cards (or even thinner). The only drawback to the CalistoPro is that it is earhook design only. It is pretty comfortable but if you prefer a headband over the top of the head you're out of luck. There's no headband for it, even if you wanted to pay extra. You can buy it at Founders Telecom by clicking on the link. The CalistoPro plugs right into a standard analog phone jack at the wall (such as you'd have at home). If you have a PBX office phone system where you have to dial a 9 to dial out, this will not work as you would have digital instead of analog lines. 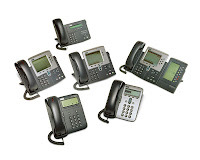 The Avaya (or Lucent, AT&T) Partner phone series is the only exception. You can plug the Calisto Pro right into the AUX (auxiliary) port on the bottom of the phone and you have a great solution. Yes, the Plantronics line of P-series (Polaris) headsets were discontinued around Q4 2008 in an effort to streamline the product assortment. Have no fear. You can get essentially the same headset now but you just need to make sure you are getting the right connector cable. The H-series headsets look identical to the old P-series but they do not have the same internal amplification properties. You will need to buy the Plantronics A10 cable which looks just like the spiral black cable you used to get with the Polaris headsets but it is actually different electronically. It will bring the amplification of the H-series headset up to the same level as the old P-series. As long as you keep your H-series headset paired with an A10 cable you'll have no problems. The only issue is if you have old P-series (Polaris) headsets also floating around your office and employees start mixing and matching over time, you will start to get complaints about weak volume. Just make some sort of marking with colored tape or something similar so you can keep the right headset with the right cord. If you buy the H-series headset by itself it will not come with the A10 cable so you'll have to be sure and order that, too. Some websites like Founders Telecom have made it easier by pairing them together for you (just like the old Polaris that came with the cable). In this case the headset and cable are already together so no need to search for the cable separately. Some phones require you to enter a passkey (sometimes called pass code, pass key or password, depending on your phone) when you establish a new bluetooth device link for pairing. For Plantronics the generic passkey is 0000. Hope that helps save you some time on hold with tech support! We also have the link to the Plantronics bluetooth interactive pairing guide below on our "Favorits Links" section. Do you still have one of the older model Plantronics cordless headsets like the CA10, CS10, CA10CD, CT10 or the Avaya 10U100 or LKA10? If so you've either already searched or are soon to be searching for a replacement battery 46365-01. 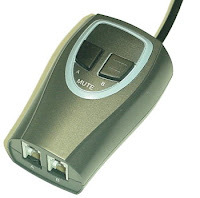 The batteries have now been discontinued by Plantronics as of Q4 2008 (since the cordless headsets themselves were discontinued several years ago) and are just about impossible to find. There is a generic substitute (same thing but not made by Plantronics) available so you can either get that or scrap your old cordless and start anew with a completely wireless model like the CS55, CS70N, CS540, etc. I think the Plantronics CT14 was worth the wait! I just got one and tested it at home. It is very similar to the prior model CT12 except for one big difference. The CT14 is on the new 1.9GHz frequency so it won't interfere with your wireless router. The old CT12 operated on 2.4GHz and it always knocked me off line since my Belkin wireless router is also on 2.4GHz. This one gives me no problems whatsoever since the 1.9GHz frequency is forever protected by the FCC as a frequency for voice only. As for functionality it is very easy to use. The range is 300 feet (the length of a football field) which is double the range of the predecessor model CT12. It has caller ID, volume control, redial, memory, etc. The battery time is also much improved. It will go all day without needing to be recharged, even if you are on the phone non-stop for the entire day. It's convertible so it comes with both the headset and ear hook. Wear it in either style or switch off just to mix things up. Your headset was working just fine. You show up for work today and it's dead or giving nothing but super loud static. Why? How did this happen? How do I fix it? Fortunately, the fix is easy. Follow these step by step instructions to re-synch (or as Plantronics calls it, "Re-Subscribe") your headset and base back to one another. If it now works but you sound like you're in an echo chamber, all you need to do is press the down arrow button on the back side of the base charging tower a few times to reduce your outbound volume and this should solve the echo problem. 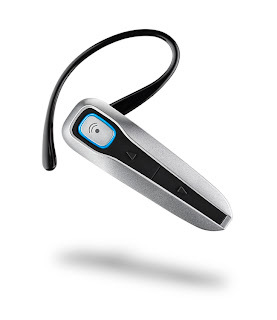 The Plantronics Discovery 925 is really a cool bluetooth headset. 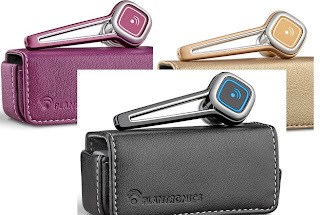 Plantronics initially launched it in three colors (gold, pink and black). The pink and gold are "limited editions" so they will be phased out and new colors will periodically be introduced. The bottom line is, if there's a color you really like, get it while the getting's good, as the saying goes. The color-coordinated leather carrying case doubles as a charger. When you are out and about and you don't have access to a plug-in charger, no worries! Your headset is charging in the leather carrying case! As for the design, it is very minimalist and almost invisible. The ear gels (3 sizes) are quite comfortable for any size ear. There is no ear hook to stabilize the bluetooth on your ear so you have to have the kind of ear that generally is well suited to an in-ear gel. As for the sound quality, it is top of the line from Plantronics. Great news! Plantronics will (finally) be coming out with a wireless headset product that lets you effortlessly switch between your computer and your telephone. For example, you can be on a Skype call on your computer and then switch to a call on your land line phone using the same wireless headset. The new Plantronics Savi should be available for sale around the middle of May 2009 so we will write a review as soon as we get our hands on one. Please check back soon.